Students at a California high school plan to respond to the national movement of school walkouts to push for new gun controls with a pro-life walkout of their own. They decided to do so after one of their teachers was placed on leave for questioning whether some protests were treated more favorably than others. 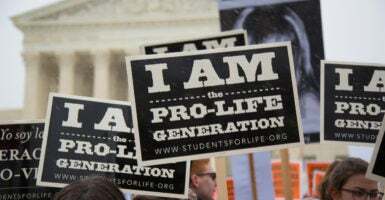 Using the hashtag #life, organizer Brandon Gillespie, a student at Rocklin High School in Rocklin, California, near Sacramento, said he wants to help spread the pro-life message and question the easy availability of abortion by organizing a walkout April 11 at 10 a.m.
Gillespie said his history teacher, Julianne Benzel, inspired him to organize the event after she was placed on paid administrative leave for questioning, after a national gun-control student walkout March 14, whether Rocklin High also would allow a pro-life walkout by students. Students and adults organized the nationwide walkouts a month after the Feb. 14 massacre at Marjory Stoneman Douglas High School in Parkland, Florida, in which a 19-year-old with a rifle killed 17 and wounded 17 others. While the teacher questioned the potential double standard, she did not discourage students from participating in the national gun-control walkout. I just kind of used the example … I know it’s really controversial, but I know it was the best example I thought of at the time—a group of students nationwide, or even locally, decided ‘I want to walk out of school for 17 minutes’ and go in the quad area and protest abortion. Would that be allowed by our administration? Benzel said she didn’t receive any backlash from her students. “All my students totally understood that there could not be a double standard,” she said. Rocklin High’s principal has met with Gillespie to discuss the pro-life walkout, which will occur on school grounds. I just got done with the meeting with my principal. I will be updating the status of the #life walkoout soon. “I would like to see if there really is a double standard, and what will come of that,” he said. Nick Wade, who participated in the gun-control walkout and is a student of Benzel’s, said he also wants to know if there will be a double standard. “I feel like if we were to go to school and say something like, ‘I want to walk out, maybe for abortion rights,’ then you know they probably wouldn’t let us, because that’s more of a conservative push. But someone wants to say, ‘Let’s walk out for gun control,’ then the school’s going to go with it, because it’s more of a popular view,” Wade said. Benzel said that she hopes the walkouts will prompt a bigger conversation, about not only gun rights in the Second Amendment, but free speech rights in the First Amendment, too. “If you’re going to allow students to walk up and get out of class without penalty, then you have to allow any group of students that wants to protest,” she said.